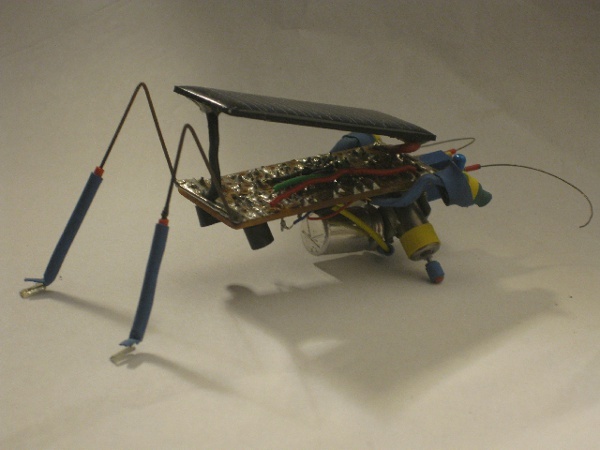 Here’s a bug shaped robot entered into the open 7400 competition. Power by a solar panel, this 7400 logic based robot moves toward the life giving light source. Powered by a solar panel, this miniature robot shuffles towards the light. This project was a venture into BEAM robotics, a now seemingly defunct genre characterized by simple circuits with complex behavior. This autonomous, bug-shaped beast soaks up sunshine on its solar panel and converts it to bursts of movement on its tiny motors. This entry was posted on Friday, November 2nd, 2012 at 3:00 am	and is filed under 7400 contest, contest. You can follow any responses to this entry through the RSS 2.0 feed. You can skip to the end and leave a response. Pinging is currently not allowed.